It’s been a typical summer with heat indexes reaching around 90 degrees. But wouldn’t you know it; I was craving a hot bowl of soup the other day. Usually, I’d want a nice big bowl of Soba Noodles with Shrimp Salad or BBQ Korean Kalbi because who wants to cook a hot meal in scorching heat? But I sometimes want a big bowl of soup like Pho or Udon or wait for it … Italian Wedding Soup. Call me weird, but I can never pass up a good bowl of soup, regardless of the weather. And next to Asian food, Italian food always satiates my wanting comfort food so it’s not surprising I’d crave Italian Wedding Soup in the middle of the summer. But before you start sweating at the thought soup, did you know that hot and spicy food can cool you down when it’s sweltering out? You see, hot food – both kinds – make you sweat. But as the sweat evaporates, your skin temperature goes down and makes feel cooler. And this phenomenon has an actual term called, “ gustatory facial sweating,” according to Luke LaBorde, a professor of food science at Penn State University. Who knew? No wonder Latin America and South Pacific Islands’ cuisines use the hottest peppers in the world and they also don’t shy away from soups! Back to my craving for soup. I might want hot soup, but I don’t want to sweat bullets while cooking. So of course, I looked to my Instant Pot to do the work. 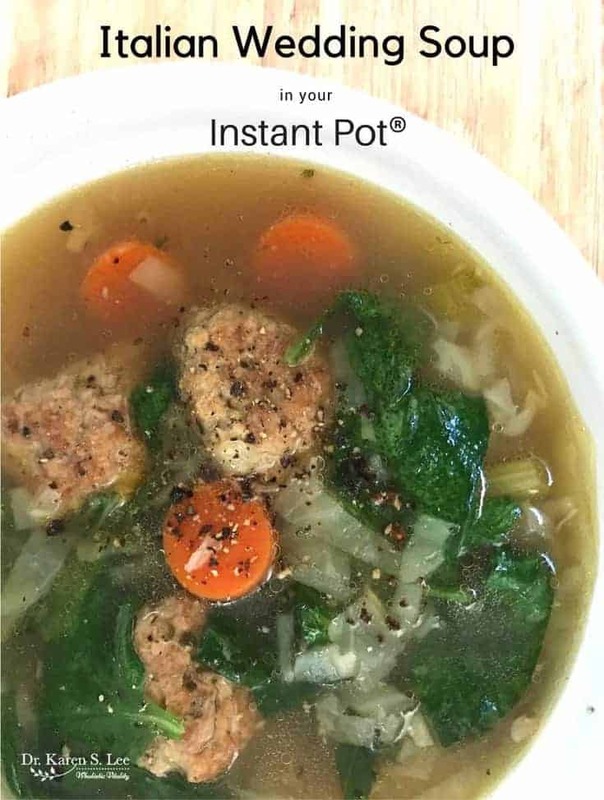 And how lucky am I to know Jennifer Robins, a Paleo cookbook author who wrote the book “Paleo Cooking with your Instant Pot®” (Amazon Affiliate Link) for me to review and there it was – a recipe for Italian Wedding Soup. It’s like, she read my mind! Italian Wedding Soup is so comforting and versatile because you can thicken it to make it hearty or leave out the thickener to make it a lighter-brothy soup, which is how I made it. I had Jennifer’s book since it was published beginning of the year and have been enjoying many of her recipes. And no wonder it made the #1 Bestseller list so many times on Amazon! Her recipes are so easy to make, they do not require exotic ingredients, and she offers 80 recipes that include soups to sides to entrees to desserts! So her book came to the rescue when I wanted to make a hearty Italian soup last week. And if you are like the rest of the world and want to make soup as the weather gets colder, you’ll want to make this Italian Wedding Soup. 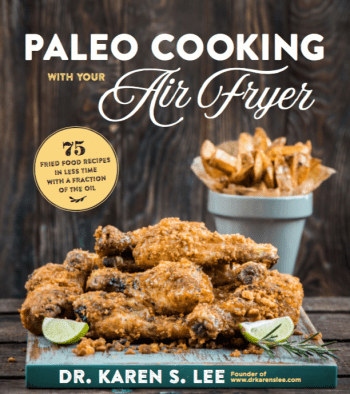 Better yet, buy her book Paleo Cooking with your Instant Pot®” (Amazon Affiliate Link) for more scrumptious recipes like Shrimp Scampi, Instant Pot Roast, Chicken Tikka Masala, Cowboy Chili, and even Chocolate Pots De Crème. Now, you might be wondering why I’m suggesting that you buy someone else’s book when I have my book, Easy Paleo Instant Pot® Recipes. Well, it’s simple. 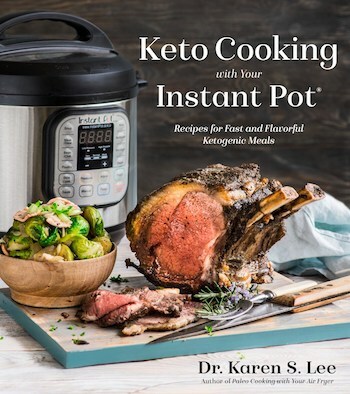 Paleo Cooking with your Instant Pot® has completely different recipes than mine! Besides, you can never have enough cookbooks. Am I right? Thought so. So order your copy today! Now, onto the recipe. Finally. Preheat your oven to 350°F in order to make the meatballs. If you do not have an oven, you have the option to cook them in your Instant Pot. Meanwhile, assemble your meatballs by combining meatball ingredients, except for the cooking fat, in a bowl and mix well by hand. Form meatballs between 1 and 2 inches in diameter and place on a parchment-lined baking sheet. Bake for 10-12 minutes and then remove from oven. If using the IP method to cook your meatballs, press the Sauté button and drizzle the cooking fat into the stainless steel bowl of your Instant Pot. Place the assembled meatballs into the bowl and brown them on all sides until they are firmly intact, or about 5 minutes. They do not need to be cooked entirely through as they will continue cooking in the broth. Now continue using the sauté feature to cook your diced onion until it is slightly translucent and begins to brown. If you need to add a bit of additional cooking fat, you can do that now. Next, add in your stock, meatballs, carrots and seasonings, reserving the spinach for later. If you are using grain-free couscous, you can add that now as well. Now secure the lid of your Instant Pot, close the pressure valve and press the Soup button (high pressure, 30 minutes). Allow the cooking cycle to complete, and then you can quick-release your steam valve. Once it is safe to open, you can remove the lid and toss in your chopped spinach. Stir well until spinach wilts. At this time, if you want to thicken your soup and did not use the grain-free couscous (which naturally thickens it), you can make a slurry with tapioca, arrowroot or cassava flour. To do this, remove 1/4 cup of the broth and whisk in the starch until it has dissolved. Now add the slurry back into the soup pot, stirring until it thickens, usually a couple of minutes.